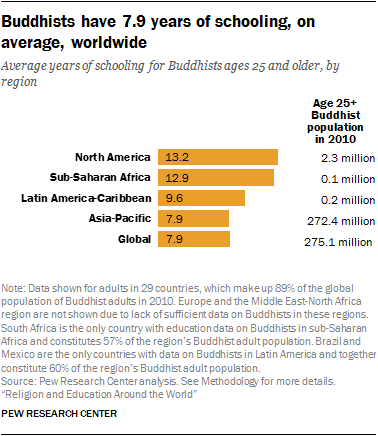 Buddhists are roughly on par with global averages in their levels of educational attainment. They have 7.9 years of schooling, on average, compared with the global average of 7.7 years for all groups, and 12% have earned post-secondary degrees, compared with 14% of all adults globally. An above-average share of Buddhist adults ages 25 and older (90%) have received at least some basic schooling, compared with a global average of 81% for all groups. Buddhist women have made notably strong educational gains in recent generations, helping to close the gender gap in primary schooling as well as higher education. Among the youngest generation of Buddhists, men and women have nearly identical educational profiles across all measures of attainment. In countries outside the Asia-Pacific region, where Buddhists are a religious minority, they often are more highly educated than the non-Buddhist population of those countries. In the United States, for example, Buddhists have an average of 13.4 years of schooling and more than half (53%) have post-secondary degrees, compared with an average of 12.9 years of schooling and 39% with higher education among non-Buddhists. And in the United Kingdom, Buddhists are more likely than the rest of the population to have higher education by 20 percentage points (52% vs. 32%). 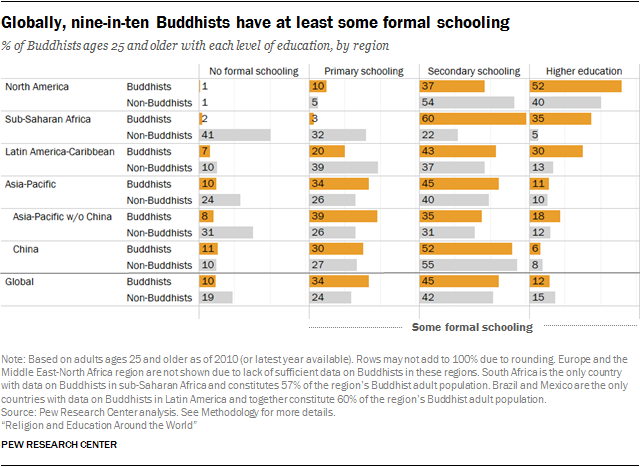 About 10% of Buddhist adults worldwide have no formal education. This includes 11% of Buddhists in China, but only 1% of those living in North America. When it comes to higher education, there is even greater regional variation among Buddhists. In the Asia-Pacific region, 11% of adult Buddhists have post-secondary degrees. Elsewhere, higher education is more common, with 30% of Buddhists in Latin America and the Caribbean and 52% in North America holding post-secondary degrees. 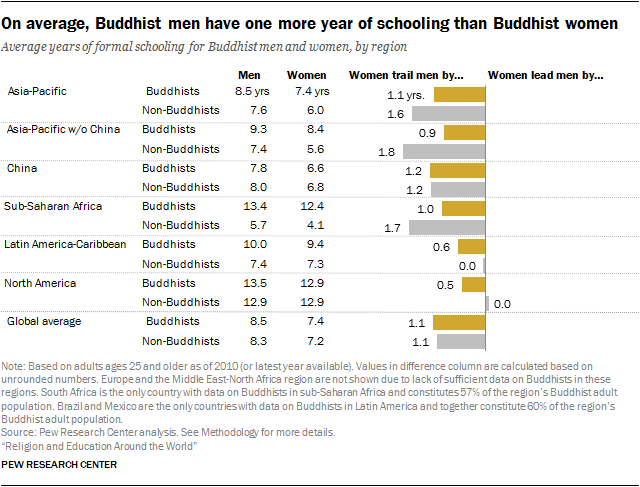 Buddhist men around the world have, on average, about one more year of schooling than women (8.5 years vs. 7.4 years). This is in line with the global gender gap for non-Buddhists (8.3 years vs. 7.2 years). Buddhist women are twice as likely as Buddhist men to have no formal education (13% vs. 6%), but women lag behind men in higher education by a smaller margin (10% vs. 13%). 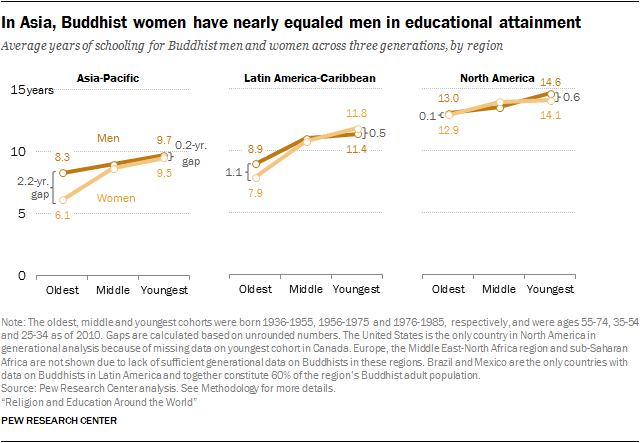 The educational gender gap among Buddhists is somewhat smaller in the Americas than it is in Asia. The share of Buddhists with no formal schooling decreased by 11 percentage points, from 15% in the oldest generation to 4% in the youngest. The largest decrease was in the Asia-Pacific region (11 points). In North America, virtually all Buddhists in each of the three generations analyzed have at least some basic schooling. Compared with the oldest generation, more than twice as many Buddhists in the youngest generation hold post-secondary degrees (19% vs. 8%). 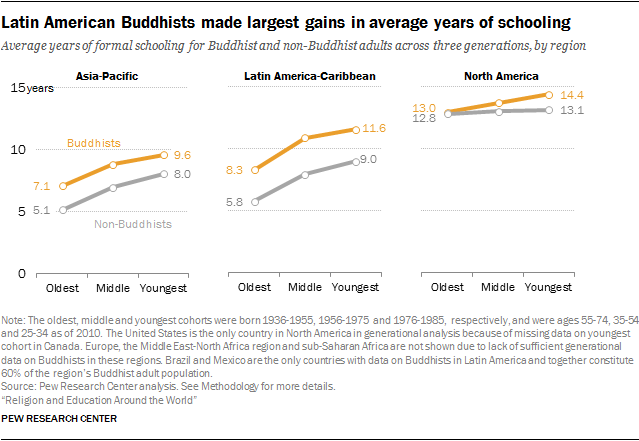 The gains have been especially large in North America, where the share of Buddhists with post-secondary degrees has increased by 25 percentage points across the three generations, from 44% of the oldest Buddhists to 69% of the youngest. Across generations, gender gaps in Buddhist educational attainment have shrunk as Buddhist women have made larger gains than Buddhist men. In the oldest generation, Buddhist women lag behind their male counterparts by an average of 2.2 years of schooling. Among those in the middle generation, and continuing among the youngest, Buddhist women have caught up to men and largely closed the gender gap in average years of schooling. Globally, the youngest Buddhist women have an average of 9.6 years of schooling, while the youngest Buddhist men average 9.8 years. 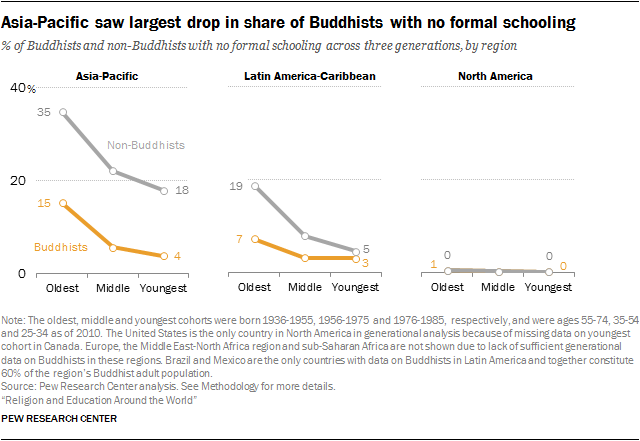 The gender gap in average years of schooling has reversed among Buddhists in Latin America and the Caribbean, where the youngest Buddhist women have half a year more of schooling than the youngest Buddhist men. By contrast, compared with the oldest generation, the gender gap in average years of schooling among Buddhists has widened slightly in North America, where Buddhist men in the youngest generation have 0.6 more years of schooling, on average, than the youngest Buddhist women. Globally, the gender gap also has closed when it comes to basic schooling. While nearly all Buddhist men in the oldest generation received some formal education (94%), about three-quarters of the oldest women did (77%). This gap has narrowed to 2 points across generations, as 97% of the youngest Buddhist men and 95% of the youngest Buddhist women have at least some formal education. These generational changes in the gender gap by this measure have been largest in the Asia-Pacific region, and particularly in China. Three-in-ten of the oldest Buddhist women in China (30%) have no formal schooling, compared with just 7% of the oldest Buddhist men. But among those in China’s youngest generation, nearly all Buddhist men and women have received at least some formal schooling (99% of men and 98% of women). The Buddhist gender gap in higher education also has closed across generations at the global level. Buddhist women in the oldest generation in the study are less likely than Buddhist men to have post-secondary degrees (6% of women vs. 11% of men), but in the youngest generation, women are now as likely as men to have higher education (19% each). In Latin America and the Caribbean, the Buddhist gender gap in higher education has reversed: While Buddhist men in the oldest generation are 8 percentage points more likely than Buddhist women to have a post-secondary education, Buddhist women in the youngest generation are 5 percentage points more likely than men to have higher education. In North America, the oldest and middle generations of Buddhist men lag behind their female peers somewhat when it comes to higher education. But the youngest Buddhist men in North America are more likely than the youngest Buddhist women (by 4 percentage points) to have post-secondary degrees. The Asia-Pacific region is home to 99% of the world’s Buddhists. But within the region, Buddhists have a wide range of educational attainment across countries, particularly when it comes to higher education. In one group of countries – including China, Nepal, India, Bangladesh, Thailand, Cambodia and Vietnam – roughly one-in-ten or fewer Buddhists have post-secondary degrees, while slightly larger shares in Malaysia and Indonesia have higher education (12% each). But in several other countries, including South Korea, Japan, Taiwan, Singapore, Australia, New Zealand and Mongolia, higher education is much more common among Buddhists, ranging from 24% in South Korea with post-secondary degrees to 44% in New Zealand. In Japan, which is home to nearly 46 million Buddhists (9.4% of the global Buddhist population), one-third of Buddhists have post-secondary degrees. These country-level differences reflect relatively recent changes. Buddhists in the youngest generation typically have higher levels of education than those in the oldest generation, and this net change is by and large greater in higher achieving countries than in lower achieving countries. For instance, 79% of the youngest Buddhists in Singapore have higher education, compared with 13% in the oldest generation in the study (a 66-point increase). Buddhists in Japan, Taiwan, South Korea and Australia also made gains of at least 25 points across these generations; in each of these countries, more than half in the youngest generation have post-secondary degrees. By contrast, Buddhists in other Asia-Pacific countries have experienced more modest growth in higher education. In Cambodia, home to more than 13 million Buddhists, the share of Buddhists with post-secondary degrees has increased from 1% among the oldest generation to just 3% among the youngest. And in China, 11% of Buddhists in the youngest generation have higher education, compared with 2% in the oldest generation. 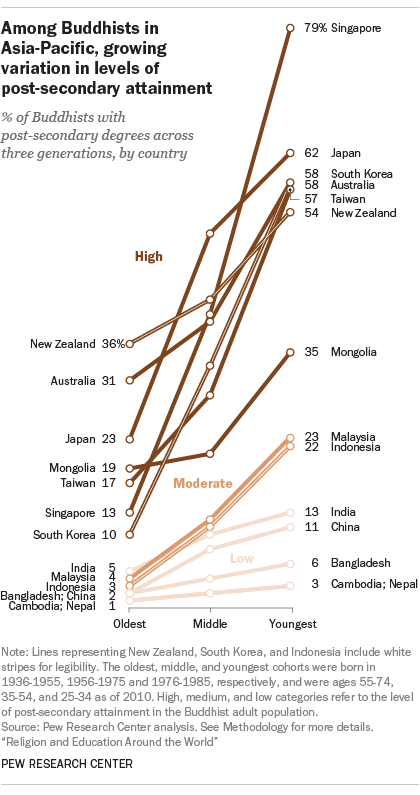 Buddhists in Indonesia and Malaysia have made larger gains, but not as large as those in the higher-achieving countries (see chart).